St James School came to the church today for their annual Armistice Day service. We were especially thinking of the centenary of the end of the First World War, and, looking at Revelation 21, of the new heaven and new earth that God will bring into being by grace, on the day when he 'wipes every tear' from our eyes. 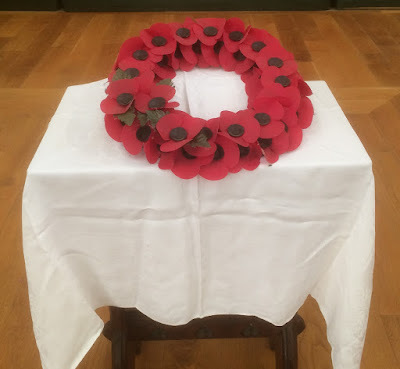 The children stood in complete silence for the Two-Minutes Silence and then filed out silently on their way back to school to the haunting sound of Elgar's Nimrod.